Most commentators assign the book of Revelation the date of 96 A.D. for its composition. Lay people often assume this date to be correct. After all, isn’t this what the marginal notes in their Bibles report? They never suspect that the same teachers who interpret the book wrong, date it wrong also. However, the evidence for this date is so equivocal and ambiguous, its probative value is practically nothing and, in fact, is assigned more by tradition than by solid evidence. As we shall see, the better view is that the book was written sometime between 56-70 A.D. and is primarily concerned with the church’s victory over the persecutions of Nero and the Jews, and the destruction of Jerusalem by Rome. As widespread as the agreement is for the date of 96 A.D. is, one would think that there must be considerable evidence to support this position. Nothing could be further from the truth. It is like the doubt the New International Version throws upon Mark 16:9-20 by separating the text from the rest of the gospel with the note: “The most reliable early manuscripts omit Mark 16:9-20.” We possess about 6,000 manuscripts. Mark 16:9-20 are missing in only two, and these two manuscripts are probably the worst in our possession (the Vaticanus and Sinaiticus). Yet, by sheer weight of the editors’ assertion, many are duped into believing that the last 12 verses of Mark are not authentic. Similarly, by the assertion of marginal notes in their Bibles, the date of 96 A.D. is assumed to be dependable despite the fact that there is little or no reliable evidence to support it. The evidence in favor of 96 A.D. can be summed up as follows 1) Oral tradition has it that John was banished to the Isle of Patmos by Emperor Domitian sometime around 96 A.D.; 2) a statement by Irenaeus, a second century “church father,” and 3) the supposition that apostasy in the Asian churches prior to 96 A.D. is unlikely and requires the later dating. There is no reliable evidence that John was banished to Patmos by Domitian. The whole tradition is similar to the oral tradition among the Catholic church that Peter was once bishop of the church at Rome: Not one verse of scripture or reliable piece of historical evidence can be cited to support it. Jerome states that John was seen in 96 A.D. and was so aged and weak and infirm that he was with difficulty carried to the church, and could speak only a few words to the people.” The fact that John was so old and weak as to have to be carried renders doubtful that he could possibly have written the book in 96 A.D. Indeed, the Revelation itself says John must again “prophesy before many peoples, nations, tongues and kings” (Rev. 10:11) something he could not do in the state of decrepitude that we would expect of one of such advanced years. The notion that the churches of Asia would not be in the state of apostasy the book of Revelation seems to describe earlier that the reign of Domitian rests upon pure supposition. That the churches of Galatia were “so soon removed” from the gospel proves that there is no substantial basis for the claim that the churches of Asia could not have apostatized early on. Indeed, Paul affirms that the apostasy associated with the latter times was well under way when he wrote Timothy. (I Tim. 4:1-6; II Tim. 3:1-5) The letter to the Hebrews speaks directly to the apostasy of Jewish believers from the faith. John also wrote of this apostasy as a present fact saying “They went out from us, but there were not of us…” (I Jno. 2:19) Like the spirit of Antichrist John said was already present and evidence that they were in the last days of the Mosaic age (I Jno. 4:3), the apostasy of the church at Ephesus and those John wrote of disproves the notion that the conditions described in Revelation “must” be assigned to a later date. This is the only evidence of any value, and it is so slight as to be nearly worthless. Irenaeus was a church father of the second century, many of whose letters have come down to us. Concerning the mystic number of the beast given Revelation 13:18, Irenaeus says thus: “If it were necessary to have his name distinctly announced at the present time it would doubtless have been announced by him who saw the apocalypse; for it was not a great while ago that (it or he) was seen, but almost in our own generation, toward the end of Domitian’s reign.”  It should be observed that the subject of the verb “was seen” is ambiguous, and may be understood to refer to either John or the apocalypse. To argue as do some that the subject of the verb is the apocalypse is purely arbitrary. In fairness, either John or the apocalypse may be the subject. But what is the point of saying the vision was seen in recent times? The nearness of the vision cannot open the symbols of the book. It was the author John to whom it belonged to expound the meaning of the mystic name. Thus if the reference is to anything, it would seem to be to John. However, even if Irenaeus’ statement is granted to mean what advocates of the 96 A.D. say, this is the only independent, external evidence favoring that date. But did Irenaeus refer to Domitian? Robert Young, the author of Young’s Analytical Concordance, wrote a commentary on Revelation published prior to 1885 wherein he makes the following statement: “It was written in Patmos about A.D. 68, whither John had been banished by Domitius Nero, as stated in the title of the Syriac version of the book; and with this concurs the express statement of Irenaeus in A.D. 175, who says it happened in the reign of Domitianou – i.e., Domitius (Nero). Sulpicius, Orosius, etc., stupidly mistaking Dimitianou for Domitianikos, supposed Irenaeus to refer to Domitian, A.D. 95, and most succeeding writers have fallen into the same blunder. The internal testimony is wholly in favor of the early date.” Because of the ambiguity of Irenaeus’ statement and the identity of the emperor he referred to, there is such a divergence of scholarly opinion regarding the credibility of the Irenaeus quotation as to render it almost worthless as external evidence of the later date. Thus the whole of the evidence favoring the date of 96 A.D. comes down to something little more than nothing. Moreover, there is no internal evidence in the book itself upon which to corroborate this date, but much against. Therefore, let us proceed to examine the evidence for an earlier dating. The Syriac is among the earliest and most important versions. The oldest of these is dated to within about one hundred years of the pens of the inspired writers. There are several versions of the Syriac in our possession, including the Peshitto (“simple”), the Curetonian, the Philoexenian, and Harclean. The oldest of these lack the books of II Peter, II and III Jno., Jude and the Revelation. Where these books are present, Revelation is captioned and entitled thus: “The Revelation which was made by God to John the Evangelist in the island of Patmos, into which he was thrown by Nero Caesar.” Thus, from the oldest and most important versions in our possession comes unequivocal testimony placing the Revelation in the time of Nero. As previously noted, several patristic writers give testimony for an early dating of Revelation. Tertullian places John’s martyrdom at Rome at the time of Peter and Paul: “Since, moreover, you are close upon Italy, you have Rome, from which there comes even into our own hands the very authority (of apostles themselves). How happy is its church, on which the apostles poured forth all their doctrine along with their blood! where Peter endures a passion like his Lord’s; where Paul wins his crown in a death like John’s! where the Apostle John was first plunged, unhurt, into boiling oil, and thence remitted to his island-exile.” The universal tradition of the early church is that Peter and Paul suffered martyrdom under Nero at Rome. Tertullian clearly joins John’s death in both time and place to those of the other apostles. Furthermore, the manner of death (boiling in oil) is consistent with the cruel deaths and tortures devised by Nero for Christians reported by Tactitus. Ephiphanius places John’s banishment and the Revelation under “Claudius.” However, many scholars believe that this is a probable reference to Nero Claudius Caesar and not emperor Claudius, Nero having assumed the Claudian family name upon his adoption by the emperor. Andreas of Cappadocia who, although himself repeating Irenaeus’ tradition of a Domitian banishment, mentions in his commentary that there were not wanting those who applied passages to the siege of Jerusalem by Titus. Arethas makes similar comments, and states concerning Rev. 7:4 “When the evangelist received these oracles, the destruction in which the Jews were involved was not yet inflicted by the Romans.” Theophlact, in his preface to his commentary on John, places the apostle’s banishment 32 years after the Ascension of Christ, squarely in the reign of Nero. Bearing in mind that patristic writers who attribute John’s banishment to Domitian do so based upon Irenaeus, and offer no independent testimony of their own, the independent testimony of external tradition, therefore, is clearly weighted in favor of a pre-A.D. 70 date of composition. Despite the impressive array of external authorities that may be cited for the earlier date, it is the internal testimony of the book itself that is most important for it bears clear and unequivocal evidence that it was written before the siege of Jerusalem. Because of limited space, we cannot cover each of these, so we must limit our discussion to those that are most important. There are several clear references in the letters to the churches indicating the presence of Judaizers in their midst as a source of trouble, strife, and division. Paul complained of these Judaizers during his ministry, calling them a “thorn in the flesh,” messengers of Satan to buffet him. (II Cor. 12:7) Paul called these “messengers of Satan” “false apostles and deceitful workers” in II Cor. 11:13. Revelation refers to these saying the church at Ephesus had tried them “which say they are apostles, and are not and hast found them liars.” (Rev. 2:2) This is a clear testimony to the nearness of time of the Revelation to the second letter to the Corinthians. To the church at Philadelphia Jesus says he will make them “of the synagogue of Satan, which say they are Jews and are not, but do lie” to come and worship before their feet. (Rev. 3:9) This is a clear reference to the utter defeat of Judaism and the destruction of the Jewish theocracy and the glory that would arise upon the New Testament church. Related to the activities of the Judaizers is the fact John portrays the tribes of Israel as still intact in their land, from which God “seals” a remnant hundred forty and four thousand. (Rev. 7:1-8) The clear implication of this imagery is that at the time Revelation was composed, the longsuffering of God was giving adequate opportunity for the Jews to obey the gospel before the storm of war, pestilence and famine swept across Palestine, destroying the nation for all time. Revelation chapter 11:1-19 depicts the temple in Jerusalem as still standing. John is told to measure the temple and altar and them that worship therein. (v. 1) “But the court which is without the temple leave out, and measure it not; for it is given unto the Gentiles: and the holy city shall they tread under foot forty and two months.” (v.2) This passage clearly indicates that the temple and city are both in existence at the time of John’s writing. The forty-two months refers to the 3 1/2 yr. war of the Romans against the Jews and the siege of Jerusalem. The identity of the “holy city” is clearly given in verse eight where it is referred to as the “great city which spiritually is called Sodom and Egypt, where also our Lord was crucified.” In Matthew 24:2, Jesus predicted that the buildings of the temple would be overthrown and not one stone left upon another. The apostles asked when these things would be fulfilled, what would be the sign of his coming and of the end of the Mosaic age. (v.3) Jesus answered saying “This generation shall not pass away until all these things be fulfilled.” This definitely limits the events of Matthew 24 and Revelation 11 to the forty-odd year period following Jesus’ ascension. Since the temple and city were both destroyed in 70 A.D. by Rome and they are depicted as still standing in Revelation 11:2, we can be certain the book was written prior to the war against the Jews. Revelation 17:10-12 marks the period in which John wrote the Revelation. Like the reference to the city and temple, this internal evidence cannot reasonably be disputed. Chapter 17:10 states unequivocally that the sixth emperor is still on the throne: “And there are seven kings: five are fallen, and one is, and the other is not yet come.” The Caesars are as follows: (1) Julius, (2) Augustus, (3) Tiberius, (4) Caligula, (5) Claudius, (6) Nero. “Five are fallen” – Julius, Augustus, Tiberius, Caligula and Claudius were deceased, “one is” – Nero was yet on the throne. The reign of Nero extended from 54 A.D. to 68 A.D. Therefore the book was almost assuredly written sometime between these dates. Alternatively, if Julius is omitted upon the premise he was not among the emperors (the empire really began under Augustus), then the sixth emperor would be Vespasian, the Roman general Nero commanded to prosecute the war against the Jews and who came to the throne of the empire after Nero’s death. In favor of this it is argued that the beast that “was and is not and yet is” (Rev. 17:8) referred to Nero, i.e., he was the incarnation and personification of the beast but was now dead and Vespasian ruling in his stead. Advocates of this interpretation also point to the language of Rev. 17:11 which is thought to refer to Domitian, the eighth emperor of Rome: “And the beast that was, and is not, even he is the eighth, and is of the seven, and goeth into perdition.” But whether it be Nero or Vespasian for present purposes, is of but little consequence. 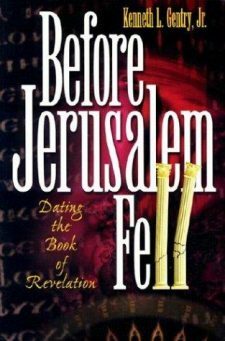 Either way, a pre-destruction of Jerusalem dating of the Revelation is easily sustained. John was given a vision of two great beasts: One arose from the sea the other arose from the earth. (Rev. 13:1,11) The “sea” beast is Imperial Rome, the “earth” beast is Roman occupied Palestine-Judea. In the book of Daniel, the sea beast is represented as the fourth world empire (Dan. 2:39-45). The land beast is probably referred to by the “little horn” in the forth beast of Daniel chapter seven. John identifies the beast in Revelation chapter 13:18 saying “Here is wisdom, Let him that hath understanding count the number of the beast: for it is the number of a man; and his number is Six hundred threescore and six.” The official title of Nero Caesar, when given its numerical equivalence in Hebrew letters, equals 666. They are: 50 – 200- 6 – 50 – 100 – 60 – 200 = 666. The variant spelling of “Neron” as “Nero” is believed to account for the variant readings in some manuscripts giving the number of the beast as 616 – the “n” being equal to 50, the change being introduced to reflect the Latin spelling of Nero, versus the Hebrew Neron. This fact, when coupled with the identifying information of chapter 17:10 saying the sixth emperor was still enthroned makes the identification all but certain. Why search more? Jesus’ promised return to destroy Jerusalem corresponds with the warnings and promises to the churches of Asia that his return was “at hand.” (Rev. 1:1,3; 2:5,16,25; 3:3,11; 16:15; 22:6,10,12,20) When Jesus said that “the time is fulfilled, and the kingdom of God is at hand: repent ye, and believe the gospel” (Mk. 1:15) we know that the kingdom was inaugurated on first Pentecost after Jesus arose from the grave, approximately 3 1/2 years from the time he made this statement. In another place, he said: “Whosoever, therefore, shall be ashamed of me and of my words in this adulterous and sinful generation; of him also shall the Son of man be when he cometh in the glory of his father with the holy angels…Verily I say unto you, That there be some of them that stand here, which shall not taste of death, till they have seen the kingdom of God come with power.” (Mk. 8:38; 9:1. cf. Lk. 9:26,27)  Clearly, both the kingdom and Christ came in that generation as Jesus foretold his disciples and the churches of Asia. If there were only 3 1/2 years to the coming of the kingdom, why should we look for longer than this in the fulfillment of the events depicted in the Revelation? How can “at hand” have such different meanings? A final consideration that should be mentioned in passing is that the events of Revelation are more consistent with the world condition under Nero, the civil wars that followed his death, and the siege of Jerusalem than any other time in history. No other period witnessed such moral depravity, license, and wanton abandon as did the empire under Nero. Tacitus’ and Suetonius’ descriptions of Nero’s depravity, bloodlust, and reign of terror stretch out in an almost endless list of murder, cruelty and vice, ended only by a violent death which launched the world into a condition of near anarchy as the world witnessed four emperors in the space of year battle for the imperial throne. Domitian’s reign, by comparison, seems almost tame and perfectly inconsequential. Certainly, there is nothing in the reign of Domitian that was of eschatological significance, such as the extinction of the Jewish state and the destruction of the city and temple. The world condition under Nero, the persecution he waged against the church, and the eschatological events culminating in the destruction of the Jewish state, coupled with the imminence of the events prophesied in Revelation, all point to the date of composition under Nero, not subsequent emperors. These are not all the pieces of evidence that point to an early date of composition, but they are among the most critical and most concise. The book of Revelation is about the consummation of the ages – the bringing to fruition God’s plan of redemption by closing out the national kingdom of apostate Judaism and bringing in the new, Heavenly Jerusalem, the Bride, and church of Christ. The events depicted belonged to the generation of those to whom the book was addressed, the seven churches of Asia. Those who are looking for future fulfillment are certain to be disappointed. No substantial or credible evidence exists in support of the traditional date of 96 A.D. Every reliable indication is that it was composed prior to 70 A.D. and the destruction of the Jewish state by Rome. Moses Stuart, Commentary on the Apocalypse (1845), Vol. I, p. 267; J. W. McGarvey, Evidences of Christianity (Nashville, Gospel Advocate, 1886), pp.34,78. Moses Stuart, Commentary on the Apocalypse (1845) Vol. I, p. 267; Milton S. Terry, Biblical Hermeneutics (1890), pp. 136,137. We pass over the Muratorian fragment. The fragment dates the Revelation before Paul’s letters, saying that Paul wrote seven letters in imitation of his predecessor, John. Concerning the fragment Stuart states: “Thus much for this incondite composition, on which, as it seems to me, no great reliance can be placed for anything of serious importance. It may, however, be regarded as conveying the common impression of that part of the church where the author lived, that Paul, as a writer of seven epistles, was preceded by John, who wrote to the seven churches of Asia Minor.” Moses Stuart, Commentary on the Apocalypse (1845), Vol. I, p. 266. Cf. Milton S. Terry, Biblical Hermeneutics (1890), p. 136. See also .F. Bruce, The Canon of the Scripture (Downers Grove, IL, InterVarsity Press, 1988), p. 160. Tertullian, On Prescription Against Heretics, 36; Ante-Nicene Fathers, Vol. 3, p. 260.